What’s comparable in PDX? Papa G’s crossed with an organic taco cart with a few boxes of Boca burgers thrown in. Why it’s worth the journey: To quote the friend that recommended it, it’s “a lifesaver” in an area one would think is remarkably vegan friendlier, in regards to entrées. The Stand is located mere minutes from the Pacific Ocean in this Orange County travel destination. While the word vegetarian is thrown around their menu, the staff clarified something great: they’re all vegan! I don’t know why the label is missing, but vegetarian does fit more with the 1970s feel of the walk up window establishment. To put this into terms Portlanders understand, The Stand seems to be the closest thing in Laguna Beach to a food cart. It’s a small attachment – a stand, if you will – to a red barn housing a bike shop, with a window for ordering and pick up. Spend a few (or 10) minutes perusing the extensive menu of plates, tamales, tacos, burgers, burritos, and juices that’s painted on the wall around the counter. Place your order, pay with cash or card, wait a few more minutes, and take your meal to one of their handful of shaded tables on the side patio, or down to the beach. The designer of The Stand’s menu is clearly a fan of variety. Nearly everything is available as a full plate, or with various sides, or a la cart, etc. I ordered the highly recommended tamale on my first visit. I considered one of the creative burger ensembles all over their menu and display board, but I was forewarned by the young woman working that the burgers were so huge, they were difficult to bite into – and that they weren’t even housemade patties. Not seeing the point in ordering what was revealed as Boca burgers (outside of a hypothetical, middle-of-nowhere trip to Denny’s), I quickly became a convert to their large tamales and creamy guacamole. The firm corn layer of the tamale is thicker than I’ve had before, and encases a mild, but fresh filling of saucy, simmered beans and vegetables. 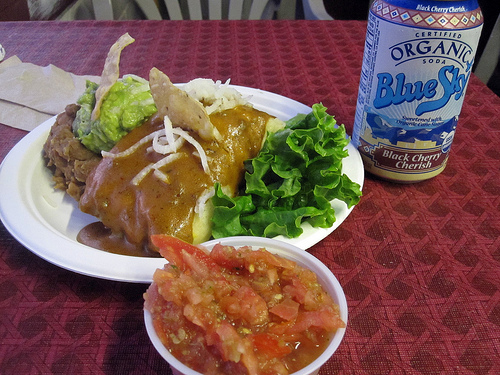 This wholesome, filling tamale, a side of chips, and the outstandingly fresh guacamole made for one heck of a dinner – which was technically the Tamale with Beans and Guacamole ($6.95) with a side of chips. I’m not using ‘outstanding’ lightly here, I’d even call it dreamy. It was lightly spiced, flavored with lime, salt, and made from avocados clearly so fresh, they deserve these words. The side of beans was again, light on the spice, but generous in portion and filling. I was tipped off that I should order the hot salsa vs. the mild original, and if you like heat, take the tip. It has much more going on. than the mild. My second visit included more guacamole, another tamale, and something appalling: plastic wrap. A warning about how dishes are served: while casually dining at the patio you receive a possibly biodegradable plate, cup, and utensils; if you take it to go, the whole thing is wrapped in plastic wrap. I almost couldn’t decide if the sight of locally made Have’ A Chips in a small paper tray, then wrapped in plastic, is more frightening or funny. I know I live in the Portland bubble of eco-friendliness, but whenever a vegan/vegetarian establishment does something like this, it hurts my head. I would have gladly walked away with an unwrapped plate had I known (and they had not been closing shortly). The actual order was similar to my last: Tamale Plate ($7.50) with a side of chips and guac, which came with a side of cabbage slaw with an Asian sweet and sour dressing. My final visit was a quick one – a smoothie to go. The Stand has a versatile selection of vegan fruit shakes and smoothies made with nut milk. This includes suggestions, of which you’re allowed to add whatever you like, including dates, for extra sweetness. My smoothie had cashew milk, mango, papaya and fig, as per the staff’s recommendation, and was thick, creamy, and substantial – and served in a biodegradable, recycled cup, to boot. If you’re looking for something fruitier, opt for a fruit shake. There are other vegan options in Laguna Beach, such as Taco Loco and Peony Chinese, but The Stand has the largest menu, by far. Long, guacamole-obsessed story short: if you’re vegan and in Laguna Beach, you’re going to be eating here, and you should make sure to get guacamole. i used to work at the stand. if you get a chance, next time try the soups. theyre made fresh by the staff and are fun to mix. also my favorite thing to eat while at work was the “soft serve”. its basically just frozen fruit but its super yummy. persimmon and banana was my fav. also the cookies are a great choice. you have to be careful though, theyre extremely delicious and addictive 🙂 if youre not a fan of onions or garlic then this is a good place to go since neither of those ingredients are used in anything at the stand. good for a date with possible smooching in the future yeah?